Innovative oilfield and renewables service company, ATAM Group has announced the launch of its proprietary “Build it Clean” process utilising the ATAM Air Jet. The new process is designed to eliminate reworks, delayed start-up dates and inflated project budgets, often resulting from piping construction cleanliness issues. The ATAM Air Jet, developed in-house, is environmentally friendly as it greatly reduces wash water usage and contaminated water disposal. Capable of cleaning and visually inspecting simultaneously, the new product used with ATAM Group’s “Build it Clean” process replaces longstanding industry methods, whilst providing a 100% internal inspection record of the completed piping systems. Current new build methods neglect cleanliness during piping system construction and are mostly considered post construction, during pre-commissioning or later in the commissioning phase. Due to this, the asset owner is increasingly forced to implement reworks that can include the removal of installed valves, piping spools and sectional welded pipework. The part deconstruction can be imperative to allow access for costly remedial works to achieve a suitable cleanliness specification. Carbon steel pipework can be especially susceptible to poor cleanliness and can often require harsher cleaning methods using strong chemicals. The ATAM Air Jet also offers a solution to clean alternative piping materials such as stainless steal and exotic alloys that until now has been almost impossible due to water jetting restrictions. The “Build it Clean” process is designed to eliminate this uncertainty for the asset owner, reducing delays and project inefficiencies. 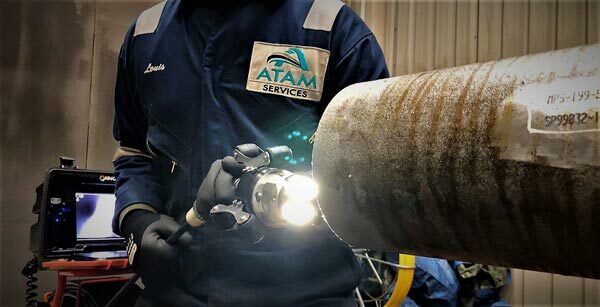 ATAM Group, led by managing director, Mark Loades, who has over 20 years of industry experience, is positively impacting aged, drawn-out procedures and is offering efficient economical solutions to existing, outdated operations across the oil and gas and renewable energy industries. “I came to realise that alternative procedures must be possible to eliminate reworks and deliver projects on schedule. In combatting rework delays, ATAM Group has made a significant investment into research and development (R&D), including new products and processes, resulting in the streamlined, ‘Build it Clean’ procedure,” Loades continues. Following a seven-figure investment into UK growth plans, including the opening of a new office site in Aberdeen, the ATAM Air Jet is the first of three new product lines that the company plans to launch in 2018.